John Evelyn (1620-1706), intellectual, diarist, gardener and founder member of the Royal Society, is best known for his Diary, the great journal of his life and times, encompassing a momentous period in British history. A lifelong collector of books, like his contemporary Pepys, Evelyn amassed over 4,000 items in his library. 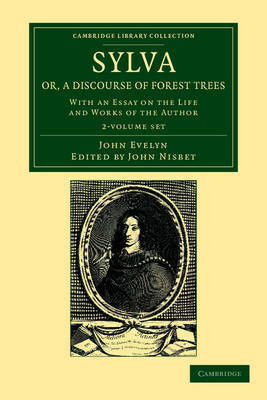 This work, originally published in 1664, was the first English-language treatise on forestry. Intended for the gentry, it aimed to encourage tree-planting after the ravages of the Civil War and to ensure a supply of timber for Britain's fast-developing navy. The first work sponsored officially by the Royal Society, it was an offshoot of Evelyn's unpublished manuscript Elysium Britannicum, a compendium of gardens and gardening. This is the 1908 two-volume reprint of the fourth edition, published in the year of Evelyn's death.